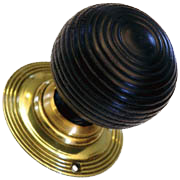 The swirls on these round-shaped wooden beehive door knobs with brass back plate stylishly reproduce the intricate Victorian design. Excellent product all as described, delivered promptly. Many thanks for your feedback on the Ebonised Beehive. It is lovely to hear back from customers and that you are happy with your purchase.